Perhaps the most important book yet written on meditation, the process of inner transformation, and the integration of spiritual practice into our American way of life. A Path with Heart brings alive one by one the challenges of spiritual living in the modern world. Written by a teacher, psychologist, and meditation master of international renown, this warm, inspiring, and expert book touches on a wide range of essential issues including many rarely addressed in spiritual books. From compassion, addiction and psychological and emotional healing, to dealing with problems involving relationships and sexuality, to the creation of a Zen-like simplicity and balance in all facets of life, it speaks to the concerns of many modern spiritual seekers. both those beginning on the path and those with years of experience. A Path with Heart is filled with practical techniques, guided meditations, stories, koans, and other gems of wisdom that can help ease your journey through the world. The author's own profoud--and sometimes humorous--experiences and gentle assistance will skillfully guide you through the obstacles and trials of spiritual and contemporary life to bring a clarity of perception this book will touch your heart and remind you of the promises inherent in meditation and in a life of the spirit: the blossoming of inner peace, wholeness, and inderstanding, and the achievement of a happiness that in not dependent on external conditions. Sure to be a classic, A Path with Heart shows us how we can bring our spirituality to flower every day of our lives. It is a wise and gentle guidebook for an odyssey into the soul that enables us to achieve a deeper, more satisfying life in the world. "This important guidebook shows in detail and with great humor and insight the way to practise the Buddha's universal teachings here in the West. Jack Kornfield is a wonderful storyteller and a great teacher." "Jack is helping to pave the path for american Buddhism, bringing essential basics into our crazy modern lives. And the language he uses is as simple and as lovely as our breath." 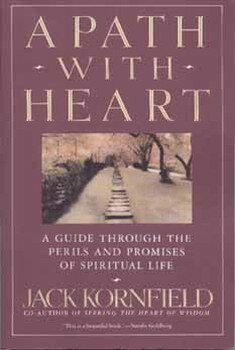 "Jack Kornfield offers a friendly, warm and eminently useful guide to the meditator's path, brimming wth clarity. A Path with Heart is an ideal companion for anyone exploring the life of the spirit." "Reading A Path with Heart is a rich and satisfying experience. God bless Jack Kornfield! He is always deep, always honest, always cuts to the bone of the matter." Our psychological and spiritual processes are too often treated as discrete. A Path with Heart happily shows how Humpty Dumpty can be put back together again! "Jack Kornfield, drawing on his combined background as a Buddhist monk and teacher as well as an academically trained psychologist, has succeeded in presenting the most profound Buddhist philosophy and psychology in an easy-to-read, heartful and humorous style. Wonderful. This unique blend of spiritual teaching, poetry, spychological insight and simple life wisdom is by far the most significant book of American Buddhism."